Mac OS X 10.4’s Dictionary program is a handy reference tool, as it’s available directly in many applications (Safari, Mail, TextEdit, Stickies, and numerous third-party programs) via the contextual menu. Just control-click on a word in your document and choose Look Up in Dictionary from the pop-up menu. (Or press Control-Command-D to display a floating definition window for the word currently under the mouse cursor.) We’ve covered a couple of Dictionary tricks here in the past ( change Dictionary’s keyboard shortcut and using double-clicks within Dictionary ), and here’s one more to add to your collection. By default, Dictionary looks up entire words. Generally, this is exactly what you want, but for some words, the results are less than useful. If you look up pedantic , for instance, you’ll get this helpful definition: “of or like a pedant.” Try gothic , and you see more detail, but the definition still begins with “of or relating to the Goths…” In both cases, you’re left needing more knowledge—what is a pedant or a Goth, in these examples. There are two easy solutions to this problem. My preferred solution is to use the above-linked double-click hint, and just double-click on the word in question. 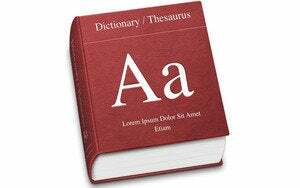 The second method, and the real subject of today’s Hint, is to simply select part of the word in your source document before using the Look Up in Dictionary contextual menu. Dictionary will only look up as much text as you’ve selected, so you’ll get the root word’s definition, instead of that of the adjective (in these examples). Finally, you can use this select-and-define trick to look up multiple-word entries in the dictionary, for things such as face paint , gauge theory , daddy longlegs , or even sand point well (10 bonus points if you know that one without looking it up!). Just select all of the words in the phrase, and then use the Look Up in Dictionary contextual menu to find their definition.